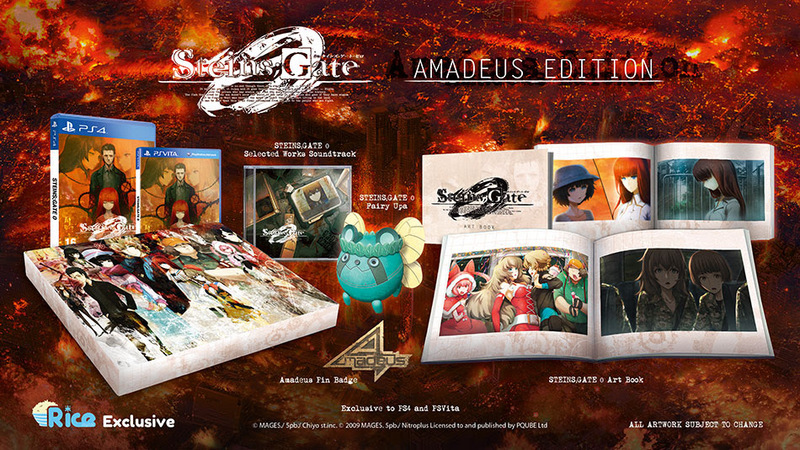 Steins; Gate 0 Amadeus Limited Edition Announced for Vita/PS4 (Exclusive to Rice Digital) – 3WIREL! The upcoming Vita title Steins; Gate 0 and Rice Digital will be offering a special collectors edition for the game on both PS4 & Vita. It contains the following items and pre-order links will be listed below as well. The return of STEINS;GATE is upon us and we can hardly wait! STEINS;GATE was one of our favourite experiences of recent times and STEINS;GATE 0 is set to continue the high standards of storytelling and top notch production values of the original. If you’ve ever thought of trying out the Visual Novel genre, this is the perfect entry point! STEINS;GATE 0 will make Future Gadget Lab members of us all later in 2016 on PS4 and PSVita.